Summer might be over. But all over the country people’s lawns still feel the heat. Smart home and gardening enthusiasts can put their worries aside for now. That's because we put together a list of the five best smart sprinkler systems available. It doesn't matter if you want a better-looking lawn or are looking to cut down on your water bill. 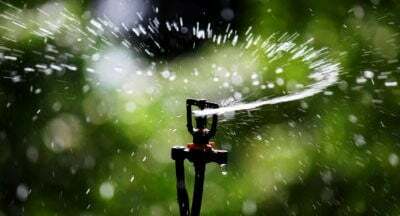 Check out the five best smart lawn watering systems for 2017. Until recently, sprinkler controls have been resigned to timed systems or valves that require manual opening. However, as smart home innovation moves outdoors, they type of control you can exercise over home sprinkler systems is increasing. Here is a guide to some of the very best smart lawn watering systems available in 2017. Skydrop offers one of the best smart sprinkler systems on the market today. 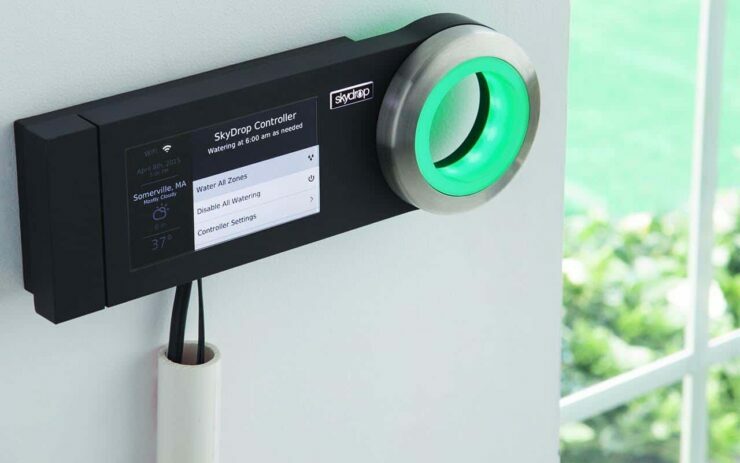 A tidy and compact unit, the Skydrop has a simple and intuitive LCD display. The unit connects simply on the side of your home and boasts an easy to install wiring interface. This can be quickly added to an existing sprinkler system. Just push in the wires, connect to the valve systems and it's ready to go. The unit connects to your home Wi-Fi and will check local weather stations hourly for real-time weather data specific to your home. The company offers its own standalone app to control from your mobile device. Additionally, it can be integrated with many of your already in place smart home technology, including IFTTT, Nest, Alexa, Echo, and literally hundreds more. The company’s website helps consumers find what rebates might be available in their community to help offset the cost of the unit, while also coming with Water Sense Certification required for many of these by the EPA. This model by Rachio is an extremely competitive model compared to the Skydrop, and for slightly less. This smart lawn watering systems offers the same easy setup and control of up to 16 different units and can be installed easily into your old system typically without having to hire a contractor. Rachio connects through Wi-Fi and can be controlled through any of your mobile devices using the iOS or Android app. This display is where the unit really shines. While there are no physical buttons to activate the unit, the app is a beautiful and intuitive control system. Each individual sprinkler head can be scheduled and activated for ideal watering times while saving you money by eliminating unnecessary water waste. Turn your control completely over to the system and the smart device will reference local weather stations to automatically adjust its watering schedule to perfectly match its environment. 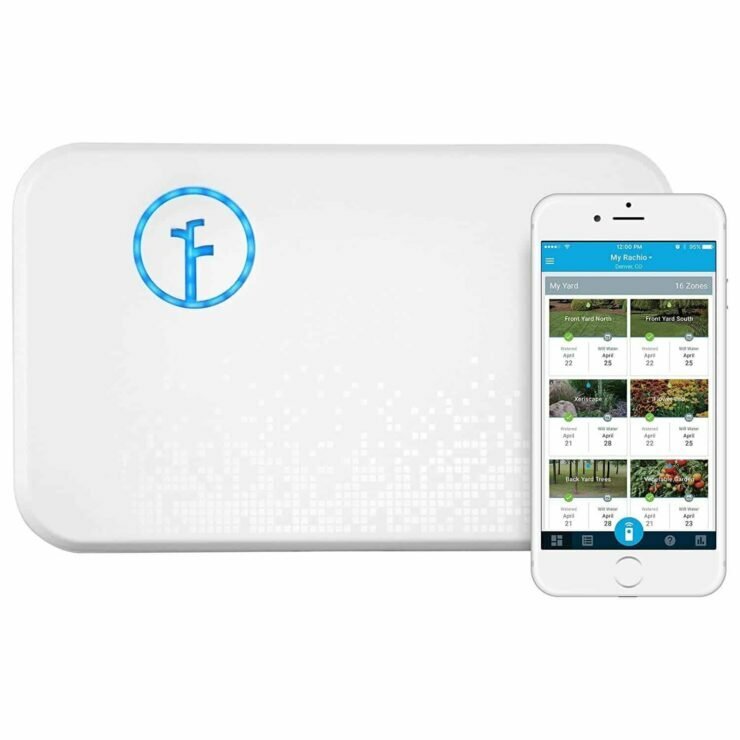 The Blossom Controller is determined to put the smart in a smart sprinkler. A plain and simple looking device, it divides your lawn into 12 monitored zones. This allows for precise control of how much water is distributed where and when. 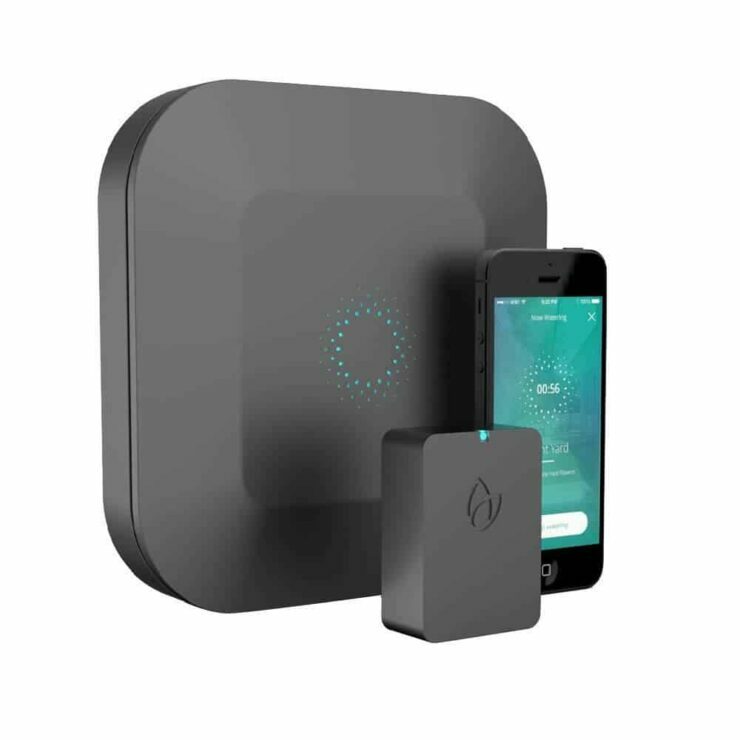 Like all the best smart sprinkler systems Blossom connects and can be controlled through Wi-Fi. The app allows for the streamlined control of these zones, allowing for each of the 12 to be assigned a name, photo and plant type. It was designed for both indoor and outdoor use and is ready to stand up to the elements as needed. 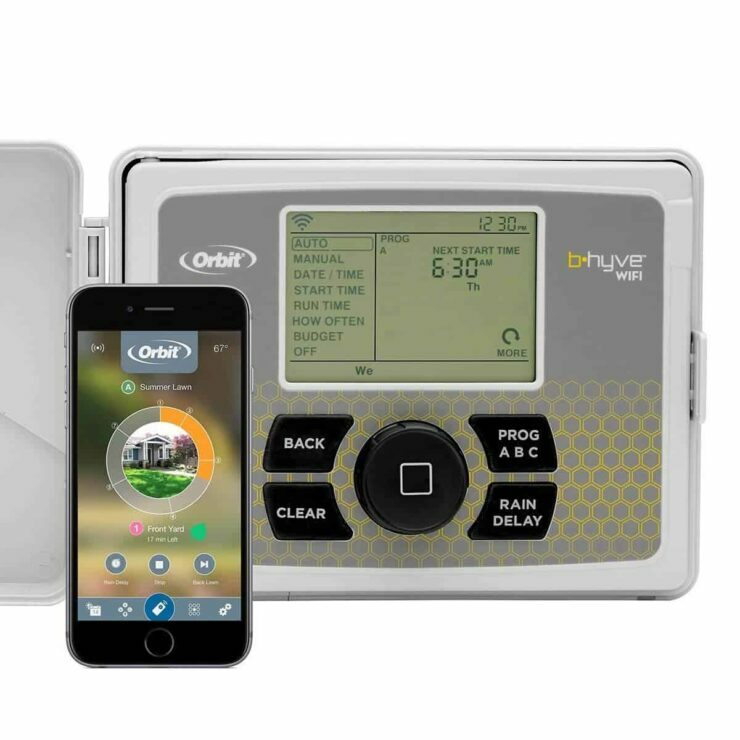 A cheaper but effective alternative to other smart lawn watering systems, the Orbit B-hyve offers many of the same features as its higher-priced competitors. Its built-in WeatherSense system provides detailed water scheduling. This is based on site conditions such as slope, soil type, sun, shade, and weather forecasts. It automatically adjusts to give your yard what it needs when it needs it. Users can choose to plug it into a wall or splice the unit into a hardwired AC power source. The B-hyve uses a wiring configuration that is compatible with most old traditional systems and can easily be installed, quickly, and safely. It comes with a free mobile app for both Android and iOS. 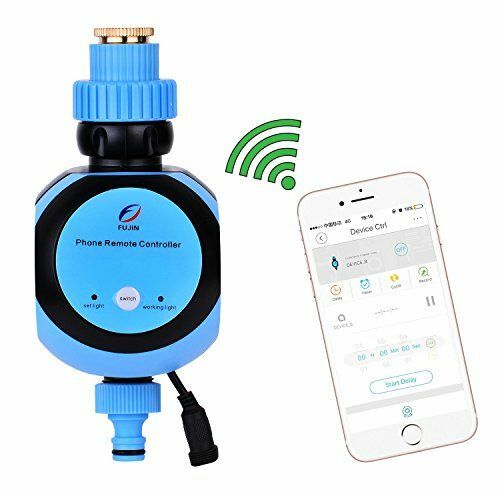 This sprinkler control system is also compatible with Amazon Alexa for quick voice control and responds to a variety of commands. A simple and easy to control system for those without an already installed sprinkler system. This valve connects directly to the water spigot on the side of your house. All that is needed in addition is a hose and a sprinkler attachment. It connects to the unit via Wi-Fi through a very simple app. This allows for a timed watering schedule or simply turn it on and off with the touch of a button. It is a scaled-down system, that still offers convenience and water efficiency leaps and bounds ahead of traditional hose sprinklers. With the smart home market exploding with new products and companies, it can be hard to tell which is the best out of any product. Smart lawn watering systems are no exception. Above we have brought together a few of the best available this year. Which smart lawn sprinklers do you recommend?